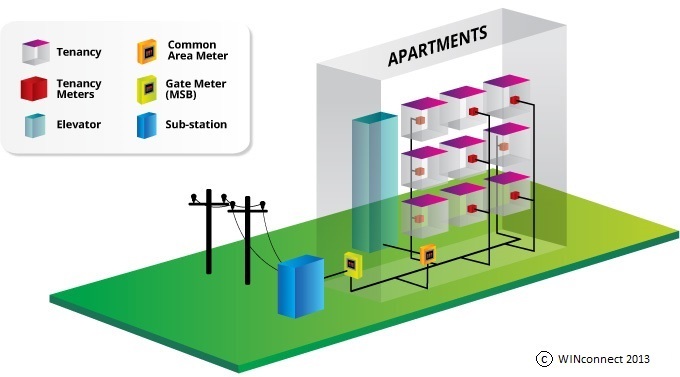 An embedded electricity network is essentially a private network within a building or self-contained site. Asset owners have to take ownership of the switchboard, electrical infrastructure, ducts and reticulation. Privatisation of the network enables them to also take ownership of the tenancy meters. All the electricity to the site is delivered through one “gate” meter, and purchased according to a “large market customer” or “bulk” tariff. The challenge is properly manage the on-selling of the bulk electricity to the end user customers in terms of regulatory compliance and economics in such a manner that it is a WIN for all. There is currently a focus on “behind the meter” management systems for local generation and energy efficiency. Where you have multiple users “behind the meter” you really have an embedded network. The embedded network is owned by the building owner. They typically appoint an Embedded Network Operator (ENO) to take care of procurement, billing, collection and customer service. This paper introduces the concept of an Embedded Network Manager (ENM) which is proposed by the regulators to commence from 1 December 2017. The purpose of this role will be to more readily facilitate retail competition with embedded networks. Nevertheless, some electricity retailers run aggressive customer acquisition campaigns that (at a point in time) are too good to believe. Consumers have the right to “churn” to these retailers or to ask the ENO to price match. The situation is more nuanced in commercial situations. Sometimes “chain” stores have national energy contracts that are better than anything that the shopping centre owner can offer; better even than the bulk supply contract managed by the ENO. Also some “chains” prefer bill aggregation services that consolidate the energy from multiple stores. In these instances, the end-consumer should have the ability to buy the cheapest power. Where an embedded network consumer exercises their right to receive electricity supply from their retailer of choice, they become what is known as a “child” of the embedded network. It is a cliché of the embedded network world that these are referred to “child customers” while those buying from the embedded network are called “orphan customers”. It is important to note here that an energy bill is made up of two major parts; the cost of the power and the network distribution charges. Even though a “child” might have a national deal for the energy consumption, they will have to pay network charges depending on where they are. Because an ENO will be paying network charges for all the consumption within an EN, it is only fair and reasonable that they recover those charges from the end-consumer. There are different approaches to this challenge in different jurisdictions. Qld and the ACT have simply disallowed choice and contestability within EN’s. There are pending changes to this in Qld proposed 1 December 2017 (see below), but for the time being there is no competitive tension in Qld. The local network distribution providers (LNSP’s) in Victoria (e.g Citipower) own and manage “child” meters within an EN. In NSW, the LNSP’s (e.g. Ausgrid) make the ENO fund the “child” meter and the meter data agent (MDA) arrangements. “Child” metering arrangements tend to happen at the time of establishment of an EN. What has been lacking across all jurisdictions has been clear processes for “child” meter management when a change occurs within an established EN. There is a triangular relationship between the Australian Energy Market Commission (AEMC), the Australian Energy Regulator (AER) and the Australian Energy Market Operator (AEMO). They put their heads together to sharpen up the National Energy Law (NEL) with regard to EN’s and energy on-selling through the promulgation of two guidelines administered by the AER. Some industry players have brushed off the guidelines, but the AER has demonstrated their enforceability. The regulators wish to ensure that competition is alive and well within embedded networks by making it easier for customers to access retail market offers. To that end, a new energy rule comes into effect on 1 December 2017. Most of the mechanics of that rule relate to improved management of the metering within embedded networks. To save you reading it chapter and verse, the AEMC have produced a succinct summary in an “information sheet” accompanied by an infographic (see below). In practise, this will mean that in embedded network with a mix of “child” and “orphan” customers there will be someone charged with the responsibility to sort out the metering. This Embedded Network Manager will be a market participant who is registered with the market operator to keep the central information systems up-to-date with metering details. The responsibilities in detail are shown in Appendix A. The rule fails to take on the physical world. For a customer in an EN to have a market retailer, they will need a market electricity meter. Who owns the meter can be a matter of discussion, but the meter has to be compliant. Exemption regimes (whether State based or AER) have always had provisions that embedded network metering comply with national standards in terms of meter certification and service installation rules (SIR’s). The SIR world is governed by the electricity industry standards for wiring, accessibility and safety with the LNSP’s getting involved. It is an unfortunate fact that many embedded networks have been established in total contravention code compliant metering or SIR’s. None of the various tiers of regulators have ever been in a position to have a view into the embedded network, and the prevalence of SIR breaches is much higher than the regulators think. The meter panels and wiring of some buildings simply do not have provision for the installation of a market meter. The newly minted Embedded Network Manager can do nothing to assist with the management of data unless someone can hang an electricity meter. If the cost of meter panel upgrades is to be borne by the consumer, then they will effectively be forced to remain in the embedded network. It could be argued that an ENM would be in breach of their certification to oversea a non-compliant EN. In any respect, they would be taking candy from a baby for the simple reason that “child” meter management would never occur. The Essential Services Commission of Victoria. Just when you thought you might get a grasp on this, you need to understand that Victoria maintains it own regulation of retail energy through the Essential Services Commission of Victoria (ESCV). The applicability of some of the AER’s protections for EN consumers is unclear in Victoria, however the recent Victorian Government review on the General Exemption Order tends to indicate that in most substantive matters, the ESCV will be instructed to follow the AER exemption regime. The extract below is from the explanatory notes for the Electricity and Other Legislation (Batteries and Premium Feed-in Tariff) Amendment Bill 2017. The Queensland Government committed to providing competition to customers within embedded networks when a nationally consistent approach for embedded networks was developed and incorporated into the National Electricity Rules (NER). 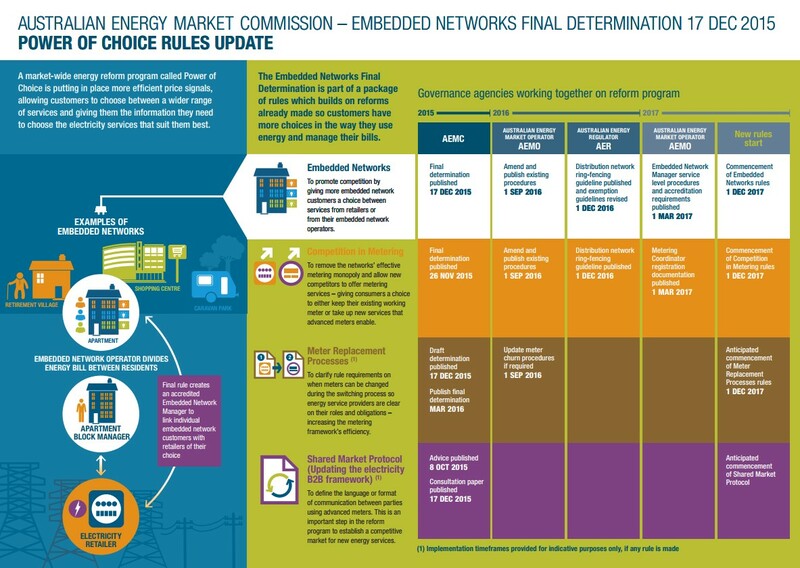 As part of the Australian Energy Market Commission’s Power of Choice Review reform program, the Embedded Network Rule directly contributes to this commitment by making changes to the NER that aim to reduce the barriers to embedded network customers from choosing the products, services and provider of retail services that suit them best. Under the National Electricity Law, applied in Queensland by the Electricity—National Scheme (Queensland) Act 1997, the NER have the force of law in this jurisdiction. Accordingly, amendments to those rules providing for the reform of arrangements regarding competition in embedded networks will come into force without the need for any Queensland specific legislative amendment. However, amendments to Queensland legislation are required in order to remove barriers that prevent competition for embedded network customers and avoid any conflict with the implementation of this major national reform in Queensland. (h) maintain a register of all allocated Child NMIs. (f) correspondence with all persons. Up to date schematics outlining any metering arrangements as they relate to each Connection Point at the site.